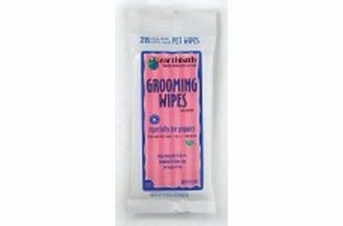 Use earthbath Especially for Puppies Travel Wipes to safely and easily wipe away dirt and odor between baths. 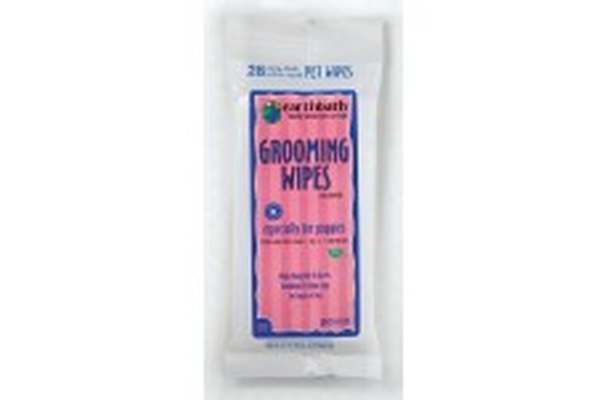 Extra mild and pH balanced for young pups, these wipes allow you to handily clean puppies' dirty paws and undercoat. Dirty bottoms too! Remove dander, drool, discharge and cling-ons from playing in the unknown. Mild cleansers freshen and deodorize while the wild cherry essence leaves a heavenly scent. Hawaiian Awapuhi extract conditions coat and imparts a show quality shine. Aloe Vera and Vitamin E moisturize coat and skin. Do not flush wipes. Store in a cool, dry place. Purified Water, Polysorbate 20 (a natural derivative of sorbitol), Hawaiian Awapuhi Extract, Aloe Vera, Vitamin E, Natural Cherry Essence and Benzoic Acid (a natural preservative). Anything that would harm you, your pet, or the planet. This product contains no: parabens, phosphates, pthalates, DEA, synthetic dyes, perfumes, alcohol or lanolin. Any residue left behind is completely safe and will not harm your pet.